I like webradios because they continually bring you varied stuff to listen, and new music to discover. These days I'm pretty much into classic/soundtracks webradios, looking for additional pieces to play in Synthesia. I'm also finally considering the possibilities of the old, but still very cool Midi format. Anyway, to get back to the main subject, what would be cool is a Synthesia Webradio streaming pure midi. For example I'm using Winamp for webradios, which is also my usual player for midi files. Recently I noticed you could configure winamp output to play the midi directly into a piano VSTi, or whatever you like. Streaming midi though winamp into a VSTi we would have great sound quality, and almost no bandwidth costs! 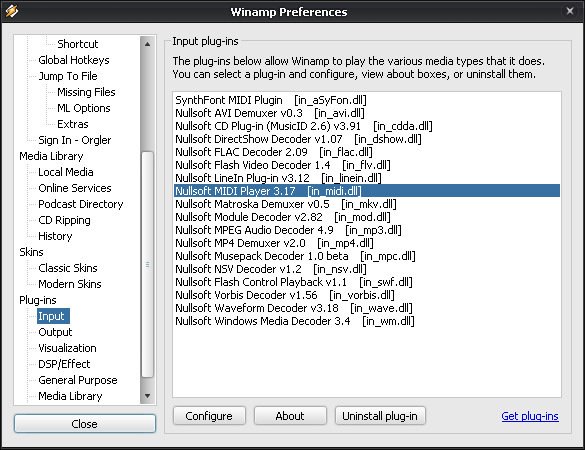 They have a well know winamp plugin for streaming, but unfortunately it's not working with midi. I've been searching for some way to actually stream midi, but most of the available technologies seems to support only mp3 or aac kind of stuff. -First would be to write a plugin for Winamp or another player to enable midi streaming, or "fake" song by song streaming. -You could also build that feature into the totally cool Synthesia Player I suggested. Are all of those midi outputs that you can use in Synthesia? Yup. For clarity I'll just add the capture of what you get when you hit the configure button on that previous image. The Bassmidi driver is by the way a very handy solution to get rather nice sound quickly, and directly into Winamp (or Synthesia). About the webradio itself, for the moment I'll just copy paste some link I saw this week, and maybe I'll get back to it later. CLAMP: command line for Winamp + Autohotkey pilot = ?